Campaign: The omens were dark, but then the prayers were answered when the Titan's Sword fell to the Lands, piercing the ground at The Strike. Since then, the Lands have prospered, the horrors of legend have faded into myths and the interest in the sword has waned. Yet some old sages have lately begun to whisper that omens are turning dark again and they are secretly hiring expeditions to the old, dark places in search of answers. Homebase (Hex 0) (0001): Dysogos - A sleepy town that has historically served as a waypoint for pilgrims and travelers to the Temple at The Strike, it has lately seen a lot more trade as Karag the Seer continues to hire workers and guards for his dig to the northeast. Those hired who come back to town usually have a generous amount of gold coin to spend, but lately, their dispositions have been darker and they speak of dangers found at the site. A recent arrival of three sages has local tongues wagging about their questions that point to trouble, which nobody wants in these parts! Location 1 (0000): Plains of Kavallus - The wild horses of the plains have historically come to this corner to foal and let their young grow before they return to their runs, but this year has been different. The Tenders, nomadic druids who both worship and care for the Kavallus, have found many of the mares and foals slaughtered, and strange pits in the ground. They have begun to abandon their tents and attempt to herd the rest of the Kavallus away from these lands, with varying success. Location 2 (0100): The Strike - The place where the Titan's Sword, a massive blade of a magical material, sits embedded in the stone, surrounded by a small crater. Over the years a small church and a few buildings have been built up around the Strike, and a temple dug underground where the faint glow of the magical material can be seen. Some still come down here to establish their vows as paladins, others to take in the essence of the Blade to supposedly increase their martial prowess, though the visits have become more rare these days. Location 3 (0200): Karag's Dig - Although the mercenaries and workers grumble and call him a "crazy old coot", the sage known as Karag continues to pay well for the excavation of a strange underground site. Karag's correspondence to other sages is full of portents and a dire warning - that those who have been taking in the "essence of the Blade" as paladins or masters of martial skills may have instead been weakening the protection that it has provided against some Horror. Of more immediate note is that the last team sent in to explore a newly discovered sublevel of this site have not returned, and on the same night, the two moons turned red! Every week, I will be posting "Three Hexes" - simple campaign starters to show that you don't need to do a lot to have interesting settings for people to play in. Feel free to use these in your game, campaign or as ways to spur on your own creativity and imagination! I've purposefully left a lot of detail out because these are supposed to spur on your imagination! The scale is what I would use in my own world, but if something else suits you better, then go for it. 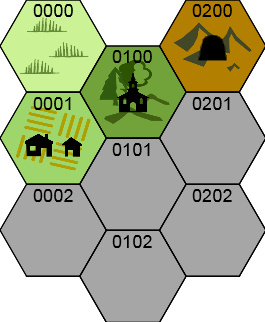 I may have the features moved about on the hexes for clarity, if they don't suit you, move them!